To the unsuspecting motorist, travel along Ali‘i Drive is a very pleasant coastal drive filled with scenic vistas, natural features and recreational opportunities. But look a little closer and discover that these seven miles of roadway hold seven centuries of Hawaiian history and culture revealed in the archaeological sites that have survived over hundreds of years. Ali‘i, Hawai‘i’s royal class, were the ruler-caretakers of the islands. The great chiefs, through their strong genealogical connections, owned all the land in the areas they controlled. Royal Centers were compounds selected by the Ali‘i for their abundance of resources and recreation opportunities, with good surfing and canoe-landing sites being favored. Structures most likely included heiau (religious temples) and sacred areas, house sites for the Ali‘i and their entourage of family and kahuna (priests). Four of the seven ancient Royal Centers in use in Kona are located on what is now called Ali‘i Drive: Kamakahonu, Hōlualoa, Kahaluʻu and Keauhou. Kamakahonu, Kailua – Occupied by Kamehameha I between 1813 and 1819. Holualoa – Area with numerous heiau and good surf. Associated with Keolonahihi in the ca. 1300, Keakamahana and Keakealaniwahine in ca. 1600 and Kamehameha I in the 18th Century. Kahaluʻu – Complex of multiple heiau surrounding Kahaluʻu Bay. Keauhou – This area is noted for the largest hōlua slide in Hawai‘i called Kaneaka, the surfing area called Kaulu and numerous heiau. Oral traditions that tell us that in the time of Pāʻao, or by western calculations the 1300s, Chiefess Keolonāhihi resided at the Hōlualoa Royal Center. Keolonāhihi (reported to be either the daughter or niece of Pāʻao) is an essential link to the beginnings of old Hawai‘i’s kapu system – the religious, social and political structure introduced by Pāʻao which lasted for some 500-years until King Kamehameha II defiantly ended it in 1819 at the Kamakahonu Royal Center. Defending these old traditions, over 300 warriors lost their lives in the fierce Battle of Kuamoʻo and are buried at Lekeleke, the southern endpoint of Ali‘i Drive. In the early-1500s, ʻUmialiloa (ʻUmi) consolidated his reign by killing off other chiefs to become the sole ruler of Hawai‘i Island. He then moved to Kona, where he was known as a benevolent chief, and during this time the Kahaluʻu area grew in its political stature and religious significance. Lonoikamakahiki, who also ruled during the 1500s, chose Kahaluʻu and Keauhou for his residence and the seat of government. The Kahaluʻu Royal Center included the ancient Hāpaiali‘i Heiau that once stood for prayers, along with adjacent Ke‘ekū heiau and Makolea heiau. All have been recently restored. In the 1600s, Keakealaniwahine, the great-great grandmother of King Kamehameha I, and her mother Keakamahana were Ali‘i of the highest rank and they resided at the Hōlualoa Royal Center. Alapaʻinui and Kalaniʻōpuʻu, 1600s to 1700s, are also associated with several sites and heiau in the region. The Kamehameha Dynasty ruled for nearly a century from the late-1700s to the late-1800s. During the late-1700s and early 1800s, King Kamehameha I, also known as Kamehameha the Great, was the first to unify the entire Hawai‘i archipelago under a single rule. He excelled at surfing at Hōlualoa Bay; in the final years of his life, Kamehameha I selected Kamakahonu as his residence and his rule established the first Capital of Hawai‘i here from 1812 until his death in 1819. Shortly thereafter, the capital of the kingdom was moved from Hawai‘i Island, never to return. Archaeological features of these various sites, for the most part, remain in place along Ali‘i Drive and signal their monumental importance in Hawai‘i’s history and culture. Several heiau have been restored in Keauhou. It was here, along Ali‘i Drive, over centuries in time where chiefs of the highest rank walked. Here was the coming of the first Christian missionaries who arrived in Kailua Bay in 1820 and began the transformation of Hawai‘i through rapid religious conversion. 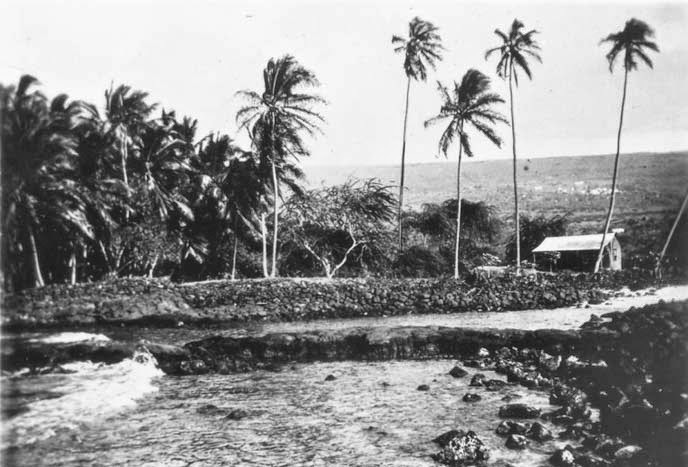 Historic sites once covered much of the Kailua to Keauhou section of the Kona Coast. It is important for us to honor the Ali‘i by maintaining, enhancing and interpreting the remaining ancestral inheritance. We prepared a corridor management plan for Royal Footsteps Along the Kona Coast Scenic Byway for the Kailua Village Business Improvement District – it runs the length of Aliʻi Drive. We were honored and proud when the Scenic Byway received an Environment / Preservation Award from the American Planning Association‐Hawaiʻi Chapter; Historic Preservation Commendation and Preservation Media Awards from Hawaiʻi Foundation from Historic Hawaiʻi Foundation; and the Pualu Award for Culture & Heritage from the Kona‐Kohala Chamber of Commerce.